Three Strikes and You're Outside the Constitution: Will the Guantanamo Bay Alien Detainees be Granted Fundamental Due Process? The United States Supreme Court has agreed to take up its first case arising from the War on Terror by hearing the consolidated appeals of two groups of foreign aliens who are or who had been detained at the United States Guantanamo Bay Naval Base, Cuba: Rasul v. Bush (No. 03-334) and Al Odah v. United States (No. 03-343). The cases stem from the United States' capture of several hundred prisoners in Afghanistan and Pakistan and their subsequent imprisonment at Guantanamo Bay. The prison began operation in January 2002, and approximately 90 detainees have been freed up to this time, many of whom spent months within the detention facility. However, about 650 detainees have yet to be released, and they face the prospect of detention for the duration of the War on Terrorism without access to a competent tribunal to assess their status as unlawful combatants—an important right since the petitioners allege that they were merely facilitating humanitarian assistance to the people of Afghanistan and Pakistan. The Geneva Convention requires that Prisoners of War (POWs) be brought before competent tribunals for status determinations, but President Bush has unilaterally decided that the Guantanamo Bay alien detainees are unlawful combatants, and as such, the terms of their detention are not governed by the Geneva Convention. Two of these detainees are soon to face prosecution in front of military tribunals, which, although created almost two and one half years ago, have not yet been used by the Department of Defense and which are themselves the subject of heated legal debate. The United States' strategic decision to locate these detainees in Guantanamo Bay also plays a part in denying them access to a competent tribunal. 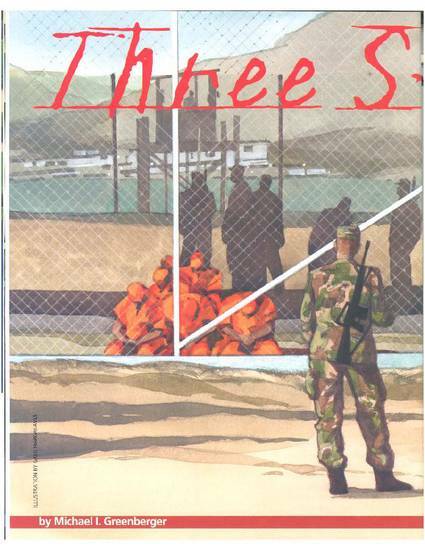 The United States leases Guantanamo Bay from Cuba, and the federal district court in these cases ruled (upheld on appeal) that the lease does not make the Guantanamo Bay Naval Base a part of the United States for purpose of granting constitutional rights (such as due process under the Fifth Amendment) to the Guantanamo detainees. Upon accepting the case on certiorari, the Supreme Court announced that it will decide [w]hether United States courts lack jurisdiction to consider challenges to the legality of the detention of foreign nationals captured abroad in connection with hostilities and incarcerated at the Guantanamo Bay Naval Base, Cuba. A favorable ruling would not only give the detainees access to U.S. courts, but would also bring them under the protection of the U.S. Constitution. Well accepted constitutional doctrine states that aliens detained outside the sovereign territory of the United States are not permitted access to the courts of the United States, while those detained inside the United States do have some limited constitutional rights, such as due process. If the Supreme Court decides that U.S. courts do have jurisdiction over Guantanamo Bay, some of the amici curiae in support of the certiorari petition have urged courts to then interpret that constitutional due process requirement in light of current international law, such as the Geneva Convention, and allow the detainees to challenge their status. The government's current denial of status hearings not only challenges the legitimacy of the United States as a nation dedicated to the rule of law, but it also sends an unintended message to other nations that such treatment of non-citizens during times of conflict is justified. The United States position with regard to the Guantanamo Bay detainees has been the subject of worldwide criticism undercutting this country's status as a Nation that prides itself on individual liberty and freedom. 37 Maryland Bar Journal 14 (2004).